In the most recept episode: we discover that if the plane had never crashed....Jack has a teenage son & Hurley is the luckiest man alive. In the alternate reality, where the plane does crash, Jack is childless & Hurley has terrible luck. Theory: Jacob caused misfortunes for both of them to eventually lead them to the island. In the case of Jack, he was the 'other man' his wife was involved with. Proof that Jacob is evil: In season 2 or maybe 3, Carl is being punished. He is strapped to a chair & is exposed to extremely loud music with crazy images on a screen. One of the images says: God loves you like he did Jacob. Is Jacob really Lucifer? Thousands of puzzlers across the globe have inquired about attending the NYPPS. A brief summary: there were 5 presentations/lectures about completely different puzzle topics. 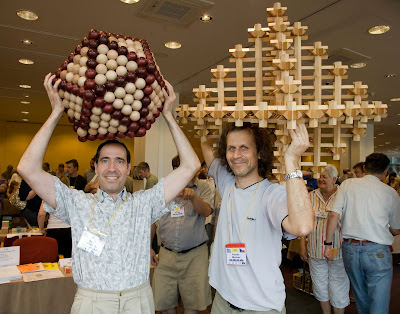 45 puzzlers convened to talk puzzles, try puzzles, and trade puzzles. Most importantly, it was an opportunity for puzzlers to mingle with like-minded people. 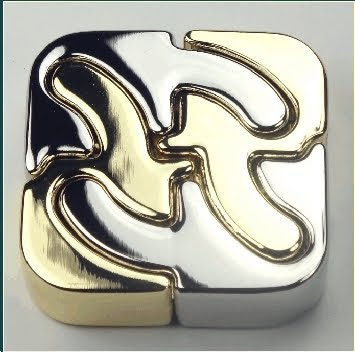 The next event: the International Puzzle Party - a week long event! A big issue with puzzle collectors: how does one display them? 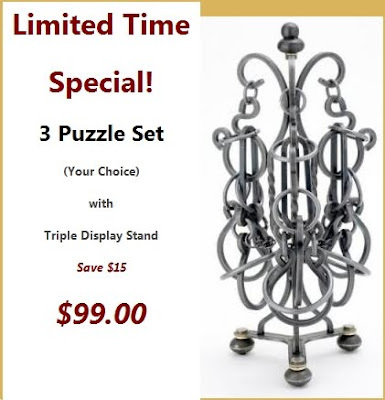 The Tucker Jones group is offering a good deal on a handsome puzzle stand. Instant Insanity Puzzle Family – In 1968, Instant Insanity was the country’s biggest game/puzzle of the year. The Apartment Puzzle – Last year the NY Times reported on an apartment that was renovated with intricate puzzles in the cabinets, walls etc. One of the architects will be presenting a slide show. The Puzzle King – Betsy Carter, author of The Puzzle King, will talk about her relative who created the first die-cut jigsaw puzzle out of cardboard. Time magazine dubbed him The Puzzle King in the 30’s. Puzzle Apps for the iphone Some people buy the ipod touch or the iphone for music or the internet. Millions of others (okay, just me) buy it just to download puzzle games. Show and tell of Trick Knives These puzzles consist of either trick opening or trick closing mechanisms. No rumble is planned. Flying Karamazov Brothers - a juggling troupe will be performing at 8:00 in the village. A classice Simpsons episode: Homer gives Marge a bowling ball for her birthday. Being so thoughtful, Homer decides to even have his name or initials painted on it. Now's your opportunity to do something similar. 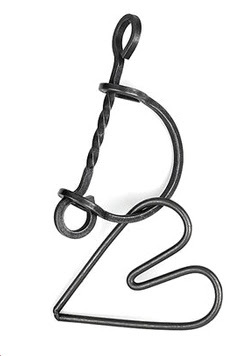 Get your loved one a Tucker-Jones tavern heart puzzle. She'll think you're sweet and then give it to you. The big event is fast approaching. People interested in attending - contact me for further details. The object of the puzzle is to move mirrors anywhere in the grid to illuminate the stars. Purple stars need lights from red & blue. The free version has 12 levels & we're stuck on 8 - temporarily. We've seen similar puzzles. Prism comes to mind. It's available only for the Nintendo DS. Look for the April 2010 issue of Games Magazine for my 2 page article called: Rubik Goes Electronic. It will be on the newsstands in a few days. Barnes & Noble carries it. It appears that Jacob has inhabited the body of Sayid. So now the battle will pit Locke against Sayid. We have not gotten our hands on this yet. 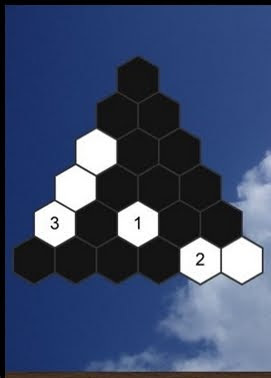 It appears to be similar to a 4 piece puzzle produced by Thinkfun. The final season of LOST starts tomorrow. Jacob & the Smoke Monster - have been around for centuries. The Island does not let women bear children - the babies & the mothers die. Jacob & the Smoke Monster are somehow feeding off them. Related: Aaron & Walt are coming back to the island. Jacob & the Smoke Monster need their bodies to continue on. Richard Alpert - has not aged in at least 100 years. Was he carried to the island on the Black Rock slave ship?